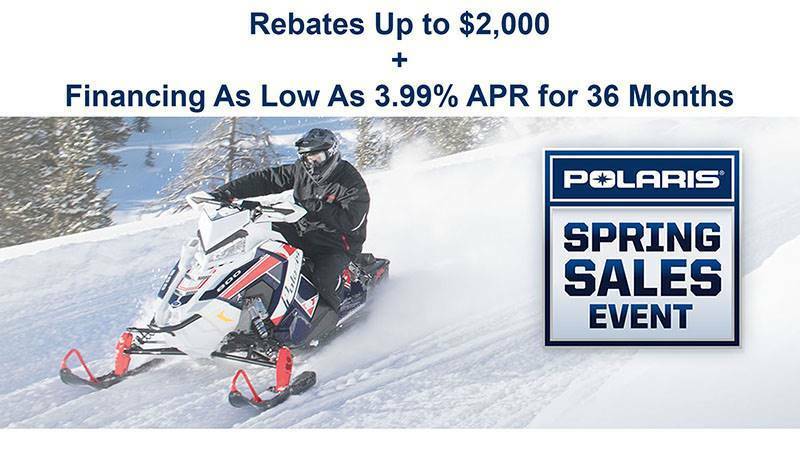 The 800 Polaris® TITAN™ SP is agile and versatile and features the Ripsaw track with 1.375 inch lugs, high-flotation PRO-FLOAT skis, and Polaris IFP Shocks. POLARIS IFP SHOCKS: Polaris Internal Floating Piston Shocks deliver both durability and high-performance. They perform reliably under the harshest conditions and also deliver a smooth ride & handling. Shocks deliver smooth, sure handling both on-trail and off. Durable, built to withstand the rigors of all terrain and conditions. Rebuildable for consistent performance season after season and enhanced long-term value. 20 X 155 X 1.375 RIPSAW FULL TRACK: This durable, aggressive track complements the Articulated Rear Suspension to provide riders with the ultimate in off-trail flotation and mobility. It also delivers a smooth ride and sure handling on the trail. Unstoppable traction that instills confidence when running off-trail. Extreme footprint provides outstanding flotation. Flotation & aggressive lugs combine for outstanding traction. Track stretches over bumps for sure traction & smooth running. Track provides impressive acceleration & sure handling on-trail. ACCESSORY SEATING OPTIONS: Polaris offers multiple accessory seating options for added rider comfort and for passenger seating. Accessory Lock & Ride® Versa Touring Passenger Seat installs quickly & easily and features passenger handwarmers & RCA plug (cord sold separately). Accessory Heated Driver Seat & Passenger Seat install quickly & easily. Seats connect to sled’s electrical system to access power for heating elements. Accessory Passenger Footrests enhance passenger comfort & security. All items available at an additional cost. EXTENDED WIND PROTECTION & AXYS TAIL 20 IN. WINDSHIELD: Polaris TITAN's integrated wind protection enhances riders’ comfort. Extended AXYS® Wind Foils deflect wind around riders. Tall 20" windshield deflects wind, snow, branches, etc., for enhanced rider protection & comfort.